OUECT’s 4Q18 and FY18 DPU of 0.75 Scts and 3.22 Scts (after rights adjustment factor) in line with expectations. 25% y-o-y decline in 4Q18 DPU due to impact from recent rights issue, and only two months contribution from OUE Downtown. Upgrade to BUY, Target Price raised to S$0.60; expected upturn in spot office rents, recovery in FY19 DPU, and higher yield vs peers to trigger re-rating. We upgrade our recommendation on OUE COMMERCIAL REIT (SGX:TS0U, OUECT) from HOLD to BUY, with a revised Target Price of S$0.60. With the large cap office REITs approaching mid-4% yield, we believe investors who want exposure to the expected multi-year upturn in office rents will seek alternative REITs with higher yields such as OUECT which is trading on c.6.9% yield. Where we differ – First and sole BUY call. Consensus has a HOLD call on OUECT, given the overhang from the potential c.18% dilution from the conversion of the convertible perpetual preferred units (CPPUs). While this is a valid concern as the conversion price for the CPPU is S$0.71, we believe it is unlikely that OUECT’s Sponsor, OUE LIMITED (SGX:LJ3), will convert them into equity as the CPPUs are out of the money. Furthermore, while it is unclear if OUECT would conduct an equity placement similar to the one done in March 2017 to help fund the redemption of some CPPUs, we believe this is unlikely due to the dilution to OUECT’s DPU from the recent rights issue. Even in the worst case of a full conversion of the CPPUs, our Target Price implies a yield of 5.0% which is c.50bps higher than the large cap office REITs, which we consider to be fair considering OUECT owns Grade A office buildings in prime CBD locations in Singapore and Shanghai. We believe the expected upturn in spot office rents, recovery in FY19 DPU, and OUECT’s high yield will encourage investors to re-look at OUECT which should trigger a rally in OUECT’s share price. After lowering our beta assumption to 0.88x from 1.0x, we raised our DCF-based Target Price to S$0.60 from S$0.47. The key risk to our view is a slower than expected recovery in spot Grade A office rents resulting in higher than expected rental income for the REIT. After incorporating the impact from the additional shares on issue from the recent rights issue using the rights adjustment factor, OUECT's 4Q18 DPU came in at 0.75 Scts (-25% y-o-y). 4Q18 DPU was weak as OUE Downtown had only contributed two months of earnings but DPU was fully impacted by the additional shares from the rights issue. Meanwhile, for FY18, DPU was at 3.22 Scts (-21.7% y-o-y) in line with our original 3.22 Scts estimate. Excluding the impact of the rights issue and acquisition of OUE Downtown which contributed to 4Q18 revenue and NPI jumping 9.2%and 5.6% y-o-y, performance for its three existing properties was weaker due either to lower occupancies or fall in passing rents. Although overall portfolio occupancy fell to 94.7% from 96.8% in 4Q17, it remained stable q-o-q. OUE Bayfront saw office occupancy dipping to 97.6% from 98.2% in 4Q17. This was partially offset by higher y-o-y passing office rents (S$11.60 psf/mth versus S$11.43 psf/mth in 4Q17), owing to positive rental reversions over the past few quarters. Meanwhile, overall occupancy for One Raffles Place (ORP) was down to 97.4% from 98.2% in 4Q17. This was mainly caused by the office component falling to 97.1% from 98.2%. While committed occupancy for the retail component of ORP has since recovered to 99.4% up from 98.5%, we understand physical occupancy remains in the mid 80’s with the full earnings/cashflow impact to be felt from 2Q19 once the majority of tenants have moved in. For 4Q18, beyond the negative drag from the lower occupancy, ORP is estimated to have weaker earnings contribution due to average office passing rents falling to S$9.45 psf/mth from S$9.92 psf/mth in 4Q17. Nevertheless, we believe passing rents and income should improve ahead as we understand ORP was able to report low single digit rental reversions in 4Q18 and the market rents should maintain their upward trajectory. In 4Q18, ORP reported signing rents of S$9.60 to S$11.80 psf/mth versus expiring rents of S$10.43 psf/mth. Occupancy for OUE Downtown fell to 93.5% from 95.1% when OUECT first announced the acquisition. However, we understand the fall was largely due management trading short vacancy for higher rents and appropriate tenants as any shortfall in income can be met by drawing down on the income support from its Sponsor. This is similar to the successful strategy employed by OUECT for OUE Bayfront. As a reminder, OUECT’s Sponsor will provide rental support of up to an aggregate of S$60.0m or for a period of up to 5 years upon completion if actual rents signed fall below the target rent of S$8.90, S$9.10, S$9.25, S$9.40, S$9.40 psf/mth in 2018, 2019, 2020, 2021 and 2022 respectively. Passing rent as at 4Q18 was S$6.94 psf/mth. Execution of the rent maximising strategy can be seen by the low double digit positive rental reversions achieved at OUE Downtown in 4Q18. Signing rents ranged from S$7.80 to S$8.50 psf/mth versus average expiring rents of S$7.44. In terms of the upcoming Deloitte lease that is set to expire in 2020 (5.6% of OUECT’s overall gross rental income and c.40% of OUE Downtown), we understand management remains hopeful of retaining Deloitte given the attractive rents in the Tanjong Pagar area (mid S$8’s to low S$9’s) relative to other parts of Singapore’s CBD (mid S$9’s to high S$11’s). Furthermore, while there are a couple of new buildings being completed in 2020-21 that could accommodate Deloitte’s space requirements, given the current economics for the development of a new office building in Singapore, we believe it may be difficult for Deloitte to relocate to a new building or refurbished office space for less than S$11 psf/mth which is materially higher than their current sub S$7 psf/mth rent. Occupancy for the office component now stands at 93.2% down from 100% in 4Q17. Likewise, the retail podium continues to see low occupancy of around 72.4% down from 90.4% in 4Q17 as OUECT takes its time to curate the right retail tenant mix for the property. However, average passing office rents inched higher to RMB9.81 psm/day from RMB9.79 psm/day in 4Q17 which is largely due to the positive rental reversions achieved over the past few quarters. For 4Q18, Lippo Plaza was able to achieve committed rents of RMB9.90-11.00 psm/day compared to expiring rents of RMB9.60 psm/day. Going forward, we understand that due to uncertain demand and new supply hitting the market, the ability to drive rents higher will difficult. OUECT reported a 1.7% increase in valuation for its original three properties. OUE Bayfront is now worth 1.7% higher at S$1,173m as the valuers have applied a 3.625% cap rate, down from 3.75% previously. Meanwhile, ORP is now valued at S$1,814m, 2.3% higher as cap rates for the office and retail component have compressed to 3.5-3.7% from 3.6-3.9% previously. For Lippo Plaza, we understand valuation in RMB terms was up 2% but flat in SGD terms owing to the weaker RMB. On the back of the higher valuations, gearing fell to 39.3% from 41.4% in 3Q18. However, NAV per unit fell to S$0.71 from S$0.91 and S$0.89 in 4Q17 and 3Q18 respectively due to the greater number of shares from the recent rights issue. The weighted average borrowing costs remained stable at 3.5% y-o-y and q-o-q respectively. The proportion of fixed rate debt stood at 76.4%. Post 4Q18, we made some minor tweaks to our FY19-20F DPU on the back of slightly stronger than expected signing rents thus far, partially offset by softer occupancy at Lippo Plaza. Nevertheless, we expect a 5% y-o-y bounce in FY19 DPU, underpinned by the full year contribution from the OUE Downtown acquisition and tailwinds from an upturn in the Singapore office market. We had previously believed that investors would shun OUECT due to the overhang from the potential conversion of the CPPUs. However, with yields for the large cap office REITs (CAPITALAND COMMERCIAL TRUST (SGX:C61U) and KEPPEL REIT (SGX:K71U)) approaching mid-4% level, we believe investors who want exposure to the expected upturn in the office market will likely seek alternatives with higher yields such as OUECT. Thus, in our view investors will likely ignore the potential overhang from the conversion of the CPPUs as OUECT’s sponsor, OUE Limited is unlikely to convert the CPPUs as it is out of the money with the conversion price of S$0.71 higher than current share price of S$0.49. In addition, while some investors may be fearful of OUECT conducting an equity placement to help with the redemption of the CPPUs similar to the exercise undertaken in March 2017, we believe this is unlikely given the dilution to DPU from the recent rights issue. Furthermore, even though OUECT’s sponsor, OUE Limited, is likely to end up in a net cash position should it complete the sale of its US Bank Tower in Los Angeles following its recent announcement that property is being marketed for sale, we believe OUE Limited is unlikely to support an equity placement which would dilute its interest in OUECT. Consequently, to better reflect greater investor interest in OUECT and reduced risk of dilution from the CPPUs in the near term, we raised our DCF based Target Price to S$0.60 from S$0.47 previously after lowering our beta assumption from 1.0x to 0.88x. The beta we have used for OUECT is still higher than the 0.7-0.75x beta we use for the large cap REITs under our coverage due to OUECT’s higher gearing and dilution risk from the CPPUs. Furthermore, we note that our revised Target Price implies a DPU yield of 5.6% or adjusted yield of 5.0% after adjusting for the impact of a conversion of the CPPUs. We believe a c.50bps spread between OUECT’s adjusted yield and the large cap office REITs is fair as OUECT owns Grade A assets in prime CBD locations in Singapore and Shanghai which we do not believe is materially different in quality to its large cap peers. In addition, while we anticipate some investors may push back on our target yield for OUECT as the yield spread between OUECT and its large cap peers has historically averaged c.1.4%, we believe the spread can compress as post the acquisition of OUE Downtown, OUECT’s market cap is now larger and its portfolio is significantly more diversified. Moreover, we believe the yield spread was elevated to account for the risk of OUECT pursuing a rights issue to fund the acquisition of OUE Downtown from its Sponsor as OUECT’s gearing hovered around the 40% level. With its Sponsor no longer having any office properties to recycle into OUECT, this concern is now longer present. Thus, we see no reason for the yield spread between OUECT and its large cap peers to compress going forward. With c.22% capital upside to our revised Target Price of S$0.60 and 6.9% forward yield, we upgrade our recommendation from HOLD to BUY. 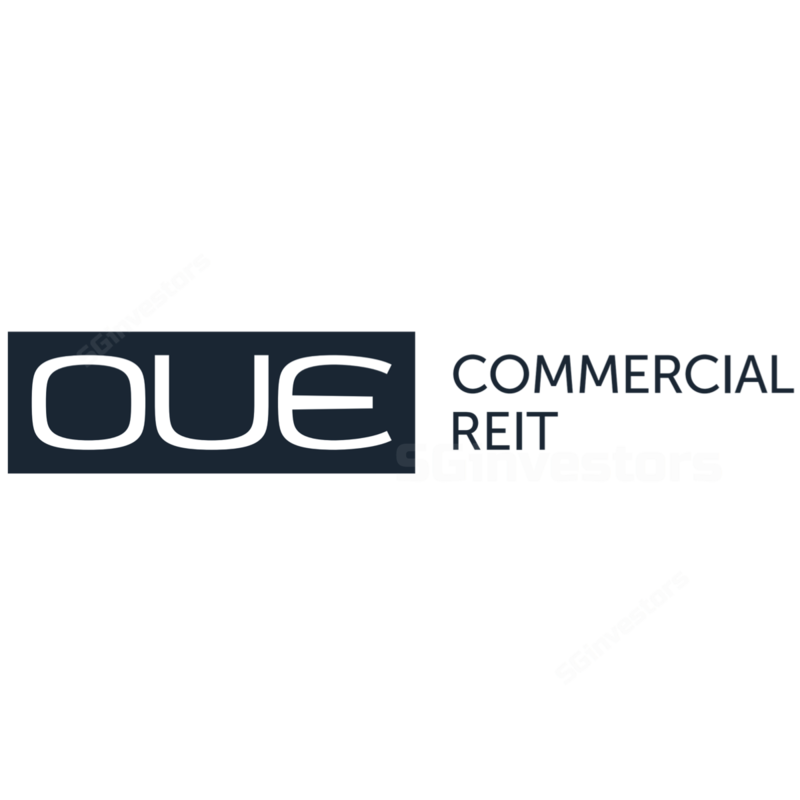 We believe as yields for the large cap office REITs are approaching mid 4% level, OUECT will be an attractive laggard play for investors seeking exposure to the expected multi-year upturn in the Singapore office market. This increased investor interest should translate to a higher share price ahead.